WHAT DO YOU TRUST MORE--AN ADVERTISEMENT OR A FRIEND? According to Nielsen, 92 percent of consumers report that a word of mouth (WOM) recommendation is the top reason they buy a product or service. The founder of one of today's most successful digital and social marketing firms, Paul M. Rand has been at the forefront of WOM marketing since social media and smartphones began revolutionizing the way we do business. In Highly Recommended, Rand reveals how customer recommendations in the digital space have radically transformed the way people buy--which means you need to come up with new methods to reach customers and improve your products. Highly Recommended provides everything you need to seize the competitive edge and grow your company. With WOM success stories from Stew Leonard's, Red Robin, Frito-Lay, Kimberly-Clark, Amazon, and other industry leaders, Highly Recommended puts you on the fast track to taking control of the dialogue about your business that's already taking place. You have instant access to just about everything your customers are saying about you. You can't afford not to take advantage of this opportunity. And you can bet that your competition is working on it right now. The power of WOM can't be overstated. It's the most important marketing tool today. 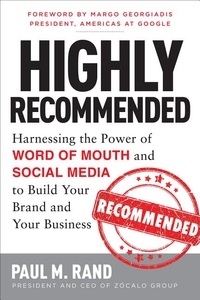 Apply the lessons of one of the pioneers of word of mouth marketing to ensure that your brand is Highly Recommended.